What a great read this was! It had such heart, along with characters I really felt invested in, and a romance I could root for. Not to mention some solid sexual tension and a good love scene or two! Owen is a 28 year-old virgin, but that is the least of his problems. He has a congenitally amputated arm, put together with a horrific mother who turned his disabilities against him. He is terribly self conscious; he is socially inept; and he stutters. Oh yeah, and he’s gay. He feels like a complete failure at normalcy and has no real belief that his life will ever get better. Until Nick moved in downstairs. Nick is a good looking, friendly veterinarian who strikes up a friendship with Owen right away. He has a sister with the same birth defect and treats Owen like no one ever has… like a regular person. And before too long, it’s obvious he sees him as something more. For some reason, though, Nick won’t let things progress between them. He’s got a secret that could destroy a relationship between them before it ever gets started. But can Owen look past Nick’s problems the same way Nick does for him? I don’t want to spoil any of the details here, but both heroes are so sympathetic. Learning about the ways Owen’s mother tore him down throughout his life made me want to jump in the book and punch her in the mouth. It made me feel like he may have never recovered if Nick and his sister had not entered his life. June is such a great character! She does so much help Owen move past his self-doubt. She is fun and full of life… and so unwilling to let her arm hold her back! But I think it was Nick who really held my heart in the story. While it’s easy to see Owen as the man who needs saving, Nick needs him every bit as much. He such a good friend to Owen –such a good man– and he has so much fear and hurt inside him. Such delicious angst! The writing is great, as you can pretty much count on with Marie Sexton. I fell in love right along with Owen and Nick. And while this is book 5 in the Tucker Springs series, it works 100% as a standalone. I would definitely recommend this one to m/m romance readers! 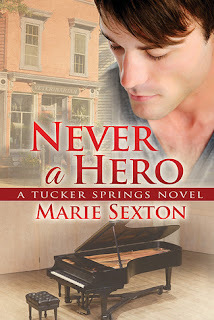 I love this Tucker Springs series. I’m glad this one was good too.